The Rev. Joseph M. McShane, S.J. Fordham is composed of ten constituent colleges, four of which are for undergraduates and six of which are for postgraduates. It enrolls approximately 15,000 students across three campuses in New York State: Rose Hill in the Bronx, Lincoln Center in Manhattan and Westchester in West Harrison. In addition to these campuses, the university maintains a study abroad center in the United Kingdom and field offices in Spain and South Africa. Fordham awards the Bachelor of Arts, Bachelor of Science, and Bachelor of Fine Arts degrees, as well as various masters and doctoral degrees. The 2017 edition of U.S. News & World Report lists Fordham as a "more selective" national university and ranks it tied for 60th in this category. Fordham University School of Law is currently ranked 37th in the United States, while Fordham's graduate programs in business, English, history, social work, education, and sociology are ranked among the top 100 in the nation. Fordham University has produced at least 102 Fulbright Scholars since 2003. Discoverer of the cosmic ray and Nobel laureate in physics Victor Francis Hess was a longtime faculty member at Fordham University. In 1846, the college received its charter from the New York State Legislature, and roughly three months later, the first Jesuits began to arrive. Bishop Hughes deeded the college over but retained title to the seminary property, about nine acres. 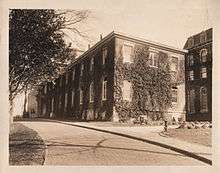 In 1847, Fordham's first school in Manhattan opened. The school became the independently chartered College of St. Francis Xavier in 1861. 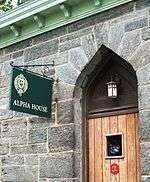 It was also in 1847 that the American poet Edgar Allan Poe arrived in the village of Fordham and began a friendship with the college Jesuits that would last throughout his life. In 1849, he published his famed work "The Bells." Some traditions credit the college's church bells as the inspiration for this poem. Poe also spent considerable time in the Fordham (then St. John's) Library, and even occasionally stayed overnight. 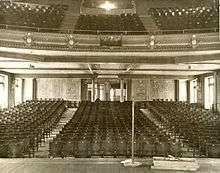 Collins Auditorium before its renovation. The College of St. Francis Xavier was closed in 1913, and various Fordham colleges were opened at the Woolworth Building in Manhattan to fill the void. Some divisions of the University including the law school were later moved to "the Vincent Astor Building" at 302 Broadway, This commenced an unbroken string of instruction in Manhattan that became what is now Fordham College at Lincoln Center, where all of Fordham's Manhattan academic operations are centered today. . Though first established in 1882, Fordham gained a significant amount of national renown from its football program in the early 20th century. Fordham football played on some of the largest stages in sports, including games in front of sellout crowds at the Polo Grounds and Yankee Stadium, a Cotton Bowl appearance and a Sugar Bowl victory, as well as producing the famed Seven Blocks of Granite (including Vince Lombardi). On September 30, 1939, Fordham participated in the world’s first televised football game, defeating Waynesburg College, 34–7. 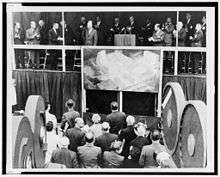 The university discontinued the program during World War II, reinstating it in 1946. However, it proved much less successful and too expensive to maintain, and was again discontinued in 1954, though would revive yet again as a NCAA Division III team in 1970 and Division I team in 1989. In the late 1950s, as the Civil Rights Movement gathered momentum in the US, Fordham students and school officials expressed ambivalence about racial justice. In the late 1960s, Fordham became a center of political activism and countercultural activity. At the Rose Hill Campus, the Fordham branch of Students for a Democratic Society organized opposition to the existence of the ROTC and military recruiters. During this period, students routinely organized protests and class boycotts and used psychoactive drugs on campus open spaces. In response to internal demands for a more “liberalized” curriculum, the university created Bensalem College in 1967. An experimental college with no set requirements and no grades, it was studied by a wide array of educators and reported on by such large-circulation publications of the day as Look, Esquire and the Saturday Review. The school closed in 1974. In 1969, students organized a sit-in on the main road leading to Rose Hill in response to an announcement that President Richard Nixon would be speaking on campus. As a result of the sit-in, Nixon was forced to cancel his plans to speak. A year later, students stormed the main administration building, occupying it for several weeks, and set fire to the Rose Hill faculty lounge. It was during this period of activism that the university’s African and African American Studies Department, one of the first black studies departments in the nation, as well as the paper, the leftist student newspaper on campus, were founded. While political activism has diminished considerably at the Rose Hill campus, it remains strong at the Lincoln Center campus, where students frequently organize protests and events in support of various political causes. In the autumn of 2007, however, the university announced its intention to seek buyers for the Marymount campus. Administrators stated that the expenses required to support the programs at the campus far exceeded their demand. University officials estimated that the revenue gained from the proposed sale would not be greater than the expenses incurred maintaining and improving the campus since the merger with Marymount. President McShane stated that the university's decision was nonetheless a "painful" one. Fordham then indicated its intention to move the remaining programs from the Marymount campus to a new location in Harrison, New York by the autumn of 2008. On February 17, 2008, the university announced the sale of the campus for $27 million to EF Schools, a chain of private language instruction schools. In 2014, Fordham University has successfully completed a five-year, $0.5 billion campaign, surpassing expectations by raising more than $0.54 billion over the five-year period. In 2009, Fordham began negotiations with New York Medical College regarding the possible merger of the two institutions. While the merger did not occur, the two schools maintain a close academic relationship in such ways as the provision of joint courses. This relationship is expected to grow in the coming years. The Fordham University Library System contains approximately two and a half million volumes, subscribes to over 65,000 periodicals and electronic journals, and is a depository for United States Government documents. In addition, the university's Interlibrary Loan office provides students and faculty with virtually unlimited access to the over 20 million volumes of the New York Public Library System as well as to media from the libraries of Columbia University, New York University, the City University of New York, and other libraries around the world. Fordham's libraries include the William D. Walsh Family Library, ranked in 2004 as the fifth best collegiate library in the country, and the Science Library at the Rose Hill campus, the Gerald M. Quinn Library and the Leo T. Kissam Memorial Law Library at the Lincoln Center campus, and the Media Center at the Westchester campus. In addition to the university's formal libraries, several academic departments, research institutes, and student organizations maintain their own literary collections. The Rose Hill campus's Duane Library, despite its name, is no longer a library, though it still contains reading and study space for students. William D. Walsh Family Library at the Rose Hill campus, as viewed from Fordham Road. The Carnegie Foundation for the Advancement of Teaching classifies Fordham as a doctoral university with high research activity (RU/H). Facilities on campus for this type of research include the Louis Calder Center, an 114-acre biological field station and the middle site along a 81-mile (130 km) urban-forest transect known as the Urban-Rural Gradient Experiment; the William Spain Seismic Observatory, a data collection unit for the US Geological Survey; and other facilities. It is a member of the Bronx Scientific Research Consortium, which also includes the New York Botanical Garden, the Bronx Zoo, the Albert Einstein College of Medicine at Yeshiva University, and Montefiore Medical Center. Furthermore, Fordham faculty have conducted research with such institutions as the Memorial Sloan-Kettering Cancer Center, Los Alamos National Laboratory, and other organizations around the world. The Matteo Ricci Society is an honor society for Fordham students who are likely candidates for academic fellowships. Students are invited to join based on academic success and other factors. The society assists its members in preparing applications for fellowships, coordinating internships, and obtaining funding for research endeavors. The Rev. William E. Boyle, S.J. Society is a parallel organization for business students. Through its International and Study Abroad Programs (ISAP) Office, Fordham provides its students with over 130 study abroad opportunities. The programs range in duration from six weeks to a full academic year and vary in focus from cultural and language immersion to internship and service learning. Some of the programs are organized by Fordham itself, such as those in London, United Kingdom; Granada, Spain; and Pretoria, South Africa; while others are operated by partner institutions like Georgetown University, the University of Oxford, and the Council on International Educational Exchange (CIEE). In addition to the ISAP programs, the university's constituent schools offer a range of study abroad programs that cater to their specific areas of study. For the undergraduate class of 2019, Fordham accepted 20,366 of the 42,811 applicants (47.6%) and enrolled 2,211. The middle 50% range of SAT scores for enrolled freshmen was 580-670 for critical reading, 590-680 for math, and 590-680 for writing, while the ACT Composite middle 50% range was 27–31. The average high school GPA of incoming freshmen was 3.64. 60, America's Best Colleges: National Universities, U.S. News & World Report, 2017. 42, High School Counselor Rankings: U.S. News & World Report, 2017. 8, Undergraduate International Business Rankings: U.S. News & World Report, 2017. 145, America's Best Colleges, Forbes, 2016. 27, Best Undergraduate Business Schools, Bloomberg Businessweek, 2016. 37, America's Best Law Schools, U.S. News & World Report, 2016. 2, America's Best Law Schools: Part-Time, U.S. News & World Report, 2016. 83, America's Best Business Schools, U.S. News & World Report, 2016. 55, America's Best Business Schools: Part-Time, U.S. News & World Report, 2016. 45, America's Best Education Schools, U.S. News & World Report, 2016. 22, America's Best Social Work Programs, U.S. News & World Report, 2016. 63, Best English Programs, U.S. News & World Report, 2016. 74, Best Clinical Psychology Programs, U.S. News & World Report, 2016. 141, "Best Psychology Programs," U.S. News & World Report, 2016. 209 "Best Biological Sciences Programs,"U.S. News & World Report, 2016. 94 "Best Sociology Programs," U.S. News & World Report, 2016. 80, Best History Programs, U.S. News & World Report, 2016. 72, Best Full-Time MBA Programs, Bloomberg Businessweek, 2015. 79, Best Executive MBA Programs in the World, Financial Times, 2015. Paris School of Mines' listing, which reviews over 3,000 educational institutions around the world, selects some 700 schools and ranks them according to their ability to place their graduates in Fortune 500 CEO and leading positions, ranked Fordham University 63rd on the list in 2009 but the research has been updated and Fordham is now listed as 16th. Fordham ranked 93rd amongst the World’s top 100 universities for producing millionaires, as compiled by THE. QS ranked Fordham 701+ in 2015. The Rose Hill campus, established in 1841 by bishop John Hughes, is home to Fordham College at Rose Hill, the Gabelli School of Business, and a division of the School of Professional and Continuing Studies, as well as the Graduate Schools of Arts and Sciences and Religion and Religious Education. Situated on 85 acres (34.4 ha) in the central Bronx, it is among the largest privately owned green spaces in New York City, situated just north of the Belmont neighborhood on Fordham Road. At one time spanning over 100 acres, the university sold 30 acres east of Southern Boulevard to the New York City government to become part of the New York Botanical Garden (NYBG). The NYBG is now an independent organization; however, Fordham students and staff have virtually unlimited access to the garden during its normal operating hours. Rose Hill is located just to the north of the Belmont neighborhood of the Bronx, also known as the "Real Little Italy of New York." 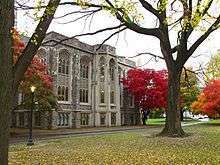 Its Collegiate Gothic architecture, expansive lawns, ivy-covered buildings, and cobblestone streets were featured in MSNBC's 2008 edition of "America's Prettiest College Campuses". Rose Hill is largely made up of nineteenth-century architecture with some contemporary buildings. The campus is home to several structures on the National Register of Historic Places. One such building is the University Church, which was built in 1845 as a seminary chapel and parish church for the surrounding community. 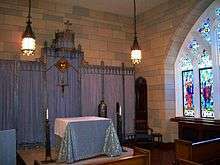 It contains the altar from the Old St. Patrick's Cathedral, as well as stained glass windows given to the university by King Louis Philippe I of France. 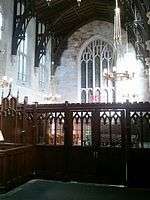 The windows are particularly notable for their connection to a workshop in Sevres, France, where the earliest stages of the Gothic Revival took place. There are eleven residence halls on campus, including a residential college and nine Integrated Learning Communities that each cater to a particular year (freshman, sophomore, etc.) or area of study (science, leadership, etc.). In addition, the campus contains two residences, a retirement home, and an infirmary for Jesuit priests. Rose Hill is served by the Fordham station of the Metro-North Railroad, which ends at Grand Central Terminal. Public transit buses stop adjacent to campus exits, and three New York City Subway stations are within walking distance. The university also provides a shuttle service between its three main campuses (the "Ram Van"), which is headquartered at Rose Hill. About 7,000 undergraduates and graduates are enrolled at the campus. The Bronx Zoo and the New York Botanical Garden are both adjacent to the eastern edge of the campus. 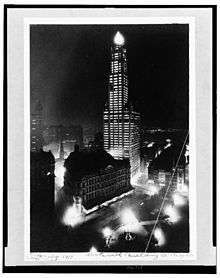 In 1954, New York City's Robert Moses proposed that Fordham might "be interested in an alternative [to renting space in the New York Coliseum] involving a new building in a part of the area to the north of Columbus Circle to be redeveloped under Title One of the Federal Housing Law... If this idea appeals to you I will ask Mr. Lebwohl to see you and explain it in greater detail." In March 1958, Mayor Robert Wagner signed the deeds transferring the Lincoln Center campus to Fordham University. The Lincoln Center campus is home to Fordham College at Lincoln Center and a division of the School of Professional and Continuing Studies, as well as the School of Law, the Graduate Schools of Education and Social Service, and the Fordham School of Business. The 8-acre (32,000 m2) campus occupies the area from West 60th Street to West 62nd Street between Columbus and Amsterdam Avenues, placing it in the cultural heart of Manhattan. It is served by public transit buses; the A,B,C,D, and 1 Subway trains, which are accessed at the 59th Street/Columbus Circle station; and the university's Ram Van shuttle. Approximately 8,000 undergraduate and graduate students are enrolled at Lincoln Center, of which about 1,000 reside in University housing. The campus currently consists of the Leon Lowenstein Building, McMahon Hall, the Gerald M. Quinn Library, and the Doyle Building. In Fall of 2014, the new Freshman residence dormitory Mckeon Hall was opened, along with the new Fordham Law School. Lincoln Center has two grassy plazas, built one level up from the street atop the Quinn Library. 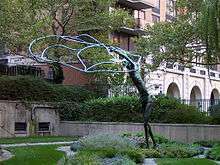 The larger expanse was once a barren cement landscape known as "Robert Moses Plaza;" the smaller is known as "St. Peter's Garden" and contains a memorial to the Fordham students and alumni who perished in the September 11, 2001 attacks. The Toward 2016 Strategic Plan prescribes a complete reconfiguration of the Lincoln Center campus, to be completed by 2032. The first phase of the project, which includes renovations of the Lowenstein Building as well as a new Law School building and residence hall designed by the distinguished architectural firm of Pei Cobb Freed & Partners, were completed in 2014. In 2014, Fordham University bought a building located at 45 Columbus Avenue and incorporated it in its Lincoln Center campus. The nine-story building is located directly across from the former Law School building. Fordham University at Lincoln Center also shares a parking lot with New York Institute of Technology, which is located just across the street from Fordham University's Lincoln Center campus. Outside the United States, the university maintains a small campus at Heythrop College, the Jesuit philosophy and theology school of the University of London. The campus is home to several undergraduate business and liberal arts programs as well as Fordham College at Lincoln Center's London Dramatic Academy. In addition, Fordham operates field offices in Granada, Spain, and Pretoria, South Africa; which house undergraduate study abroad programs. Finally, the university provides faculty for the Beijing International MBA Program at Peking University in China. The program has been ranked #1 in China by Fortune and Forbes Magazines since its creation by Fordham in 1998. The relationship between the Lincoln Center campus and some of the Upper West Side community residents have been strained, over campus development. In 2010 the New York State Supreme Court dismissed a lawsuit against Fordham brought by the Alfred Condominium Complex. The suit was filed in response to the University’s expansion plans at Lincoln Center and their expected visual and auditory impact on the surrounding community. The Lincoln Center campus does, however, have a lively connection to the artistic scene in Manhattan through its dance and theater productions and visual art exhibitions. The Rams football program boasts a national championship title (1929), two bowl game appearances (1941 and 1942), two Patriot League championships (2002 and 2007) and corresponding NCAA Division I Football Championship appearances, and the 15th most wins of any college football program. It is best known, however, for the "Seven Blocks of Granite," a name given to the team's 1928 and 1936 offensive lines. The 1936 team was coached by "Sleepy" Jim Crowley, one of the University of Notre Dame's famed "Four Horsemen," and included Vince Lombardi, the legendary professional football coach. Furthermore, it is credited with inspiring the term "Ivy League" after New York Herald Tribune sportswriter Caswell Adams compared it to the squads of Princeton and Yale, two powerhouses of the day. Adams remarked disparagingly of the latter two, saying that they were "only Ivy League." There are currently four Rams in the National Football League. Moreover, the Los Angeles Rams NFL franchise was named in honor of Fordham's football heritage. The University's men's basketball program also has an impressive heritage, boasting four NCAA Men's Division I Basketball Championship and 16 National Invitational Tournament appearances. During the 1971 season, the program enjoyed its best campaign ever, compiling a 26–3 record and earning a #9 national ranking. That team was coached by Digger Phelps, later the renowned University of Notre Dame men's basketball coach and its player's roster included Peter "PJ" Carlesimo, the former head coach of the Brooklyn Nets NBA franchise. Fordham basketball plays in the Rose Hill Gymnasium (also known as "The Prairie"), the oldest on-campus venue currently in use by an NCAA Division I basketball team. The University has a number of publications, including The Observer, the award-winning newspaper for the Lincoln Center campus; The Ram, the university's journal of record; and the paper, a student-run free-speech publication. WFUV is Fordham's 50,000-watt radio station, broadcasting on 90.7 FM. Founded in 1947, the station serves approximately 350,000 listeners weekly in the New York City metropolitan area. It is a National Public Radio affiliate and has an adult alternative format on weekdays and a variety format on weekends. In 2012, The Princeton Review ranked WFUV the 10th most popular college radio station in the United States. Fordham offers a wide variety of performing arts groups, spreading from its non-major theater groups at Lincoln Center and Rose Hill (the Mimes and Mummers, Fordham Experimental Theater, the Theatrical Outreach Group, Splinter Group) to choirs (University Choir, Schola Cantorum, Gloria Dei Choir), to its considerable a cappella groups spanning both campuses (Fordham Ramblers, Satin Dolls, b-Sides, Hot Notes, F-sharps). Fordham College at Rose Hill has a long, rich history of college theater. The Mimes and Mummers, the oldest entirely student run club at Fordham University and one of the oldest college theater groups in the United States, was founded in 1855 as the Saint John's Dramatic Society. The Mimes put on two musicals, a drama, and a comedy each year, which all must be non-student written shows, as well as workshops designed to help students at Fordham learn about theater. The club receives a budget from the school, allowing them to hire professional directors, music directors, and choreographers as a production calls for, but each show remains fully student produced, with all elements of technical design being run by members on the club's executive board. In 1905, with the construction of Collins Hall, Fordham University became the first place on the East Coast of the United States to have a theater in the round. 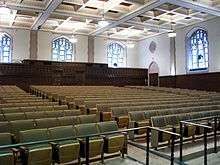 The Penthouse Theatre, located on the fourth floor of Collins Hall, served as a place for both professional show debuts to occur as well as a home for theater groups like the Mimes and Mummers. The Penthouse Theatre was turned into office space by Fordham University in 1966. 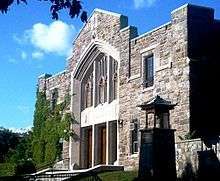 In addition to The Mimes and Mummers, Fordham University's Rose Hill campus also has two additional theater clubs, Fordham Experimental Theater (FET), and the Theatrical Outreach Program (TOP). The Dorothy Day Center for Service and Justice is responsible for overseeing Fordham's various community service and humanitarian initiatives. Grounded in the Jesuit principle of homines pro aliis ("men and women for others"), the center organizes projects in such areas as poverty, hunger, education, and disaster relief. As a result of the Dorothy Day Center's efforts, the university performed approximately one million hours of service in 2011, ranking it sixth in the country in terms of community outreach. A popular volunteer location among students is the Society of Jesus New York Province Health Care Center at the Rose Hill campus, where those students interested in nursing can gain practical experience in the field. The Dorothy Day Center also offers a pre-orientation program for incoming Fordham Freshmen called "Urban Plunge" that introduces students to themes of social justice across New York City. Fordham does not sponsor any Greek letter fraternities or sororities. Councils of the Knights of Columbus, the national Catholic service fraternity for men, and its sister organization, the Columbiettes, are hosted on campus. In addition, Fordham sponsors a chapter of Pershing Rifles, the national military fraternity. Winter Ball: The Winter Ball is a business casual event held every winter by the United Student Government and the Campus Activities Board of Fordham University at Lincoln Center. It takes place at a different location each year in New York City. Past venues have included the Rainbow Room, the Russian Tea Room, and the Mandarin Oriental Hotel. Under the Tent: The "Under the Tent" Dance is a smart casual event held the weekend before final exams. Sponsored by the university's Residence Halls Association, it takes place underneath a tent on Martyrs' Lawn, Fordham's second-largest quadrangle, and has a different theme each year. The dance is part of the Spring Weekend Festival, which also includes two concerts, a barbecue, a race around the Rose Hill campus, and a comedy show. The dance was previously held at the Lincoln Center campus as well, but was replaced in 2015 by an end-of-the-year event called "The Bash." Midnight Breakfast: Each semester, the official beginning of the final exam period is marked by a "midnight breakfast," in which Fordham administration and professors cook students their favorite breakfast items so as to prepare them for the long night of studying ahead of them. Despite the name, the meal is not held at midnight. The Liberty Cup: The Liberty Cup is awarded annually to the winner of the football game between Fordham and Columbia Universities. The tradition began in 2002, a year after the Fordham-Columbia game was postponed due to the September 11th attacks. As of 2016, the series was ended by Columbia. Encaenia: Fordham College at Rose Hill hosts an Encaenia each year in early May. Faculty, administrators, and students process in academic regalia, and candidates for degrees at the current year's Commencement receive various awards and honors. The ceremony includes a sentimental speech by the year's valedictorian, as well as a generally more humorous, yet, equally endearing speech by the honorary Lord or Lady of the Manor. The Ram: The ram became the university's mascot as a result of a slightly vulgar cheer that Fordham fans sang during an 1893 football game against the United States Military Academy The fans began cheering, "One-damn, two-damn, three-damn, Fordham!" which was an instant hit. Later, "damn" was sanitized to "ram" so that the song would conform to the university's image. The Terrace of the Presidents: The Rev. Robert Gannon, SJ, president of Fordham from 1936 to 1949, initiated the custom of engraving the granite steps leading up to Keating Hall with the names of heads of state who visit the university. Among the names engraved are George Washington, who visited the Rose Hill Manor before it was succeeded by St. John's College in 1841; Franklin Delano Roosevelt; Harry S. Truman; Richard Nixon; and the names of various other heads of state from around the world. School songs: Fordham's official school song is "Alma Mater Fordham," and its fight song is "Fordham Ram" by J. Ignatius Coveney. In December, 2013 the lyrics to "Fordham Ram" were changed from "Hail Men of Fordham, hail" to "Hail Rams of Fordham hail" in an effort to be more inclusive of the school's female majority. "The Marching Song" is typically played during parades and after athletic games (particularly after a Ram victory). Donald J. Trump, the President-elect of the United States of America, attended the university, but left with no degree. 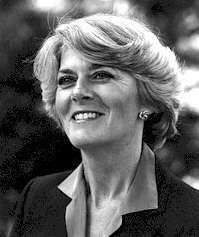 Geraldine Ferraro, the first female vice presidential candidate of a major political party in the United States, attended Fordham, as did three current members of the United States House of Representatives and numerous past members of Congress, including at least two United States Senators. Current New York State Governor, Andrew Cuomo, is an alumnus. A number of Fordham graduates have served at the highest levels of the U.S. Executive Branch, including John E. Potter, former Postmaster General of the United States; William J. Casey, Director of U.S. Central Intelligence from 1981 to 1987; John N. Mitchell, former U.S. Attorney General; and Bernard M. Shanley, Deputy Chief of Staff and White House Counsel to President Dwight D. Eisenhower, and John O. Brennan, current Director of the Central Intelligence Agency. Fordham claims a number of distinguished military honorees, including three Medal of Honor recipients and a number of notable generals, including General John "Jack" Keane, retired four-star general and former Vice Chief of Staff for the United States Army, and Major General Martin Thomas McMahon, decorated American Civil War officer. Fordham has produced college and university presidents for at least 10 institutions around the United States, including two for Georgetown University and one each for Columbia University and New York University. 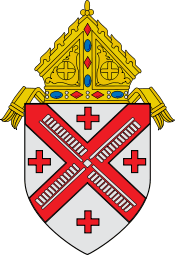 Francis Cardinal Spellman, the late Archbishop of the Metropolitan See of New York, was also a Fordham graduate. Fordham alumnus James B. Donovan, who defended Rudolph Abel in his spy trial and later negotiated the release of Francis Gary Powers, is the subject of Steven Spielberg's Oscar-nominated film Bridge of Spies. Business and finance magnates that have attended Fordham include Anne M. Mulcahy, retired Chairperson and CEO of Xerox and named one of the "50 Most Powerful Women in Business" in 2006 by Fortune Magazine; Rose Marie Bravo, Vice Chairman and former CEO of Burberry and named one of the "50 Most Powerful Women in Business Outside the United States" in 2004 and 2005 by Fortune Magazine; E. Gerald Corrigan, former President of the Federal Reserve Bank of New York; Maria Elena Lagomasino, CEO of JP Morgan Private Bank from 2001 to 2005 and currently on the board of directors of Coca-Cola; Joe Moglia, Chairman and former CEO of TD Ameritrade; John Leahy, Chief Operating Officer of Airbus; Stephen J. Hemsley, CEO of UnitedHealth Group; Wellington Mara, former owner of the New York Giants; John D. Finnegan, Chairman, President, and CEO of Chubb Corporation; Mario Gabelli, billionaire and founder and CEO of GAMCO Investors; Lorenzo Mendoza, billionaire and CEO of Empresas Polar; Eugene Shvidler, billionaire and international oil tycoon. Fordham's list of contributions to the arts and entertainment industry includes Denzel Washington, two-time Academy Award and two-time Golden Globe Award-winning actor; Alan Alda, six-time Emmy Award and six-time Golden Globe Award-winning actor; Dylan McDermott; actress Taylor Schilling; actress and comedian Regina Hall; singer-songwriter Lana Del Rey; Mary Higgins Clark, best-selling suspense novelist; Don DeLillo, acclaimed novelist and Pulitzer Prize nominee; Robert Sean Leonard, Academy Award nominated Dead Poets Society and Emmy and Golden Globe winning television show actor, House actor; Bob Keeshan, television's multiple award-winning "Captain Kangaroo;" John LaFarge, painter, muralist, and designer of stained-glass windows; Virginia O'Hanlon, who, as a child, wrote a letter to the New York Sun that prompted the famous response "Yes, Virginia, there is a Santa Claus." 1 2 3 4 5 6 "Fordham University Common Data Set 2015-2016". Fordham University. 1 2 3 4 5 6 7 8 9 "Fordham Facts". Fordham.edu. 2012-06-30. Retrieved 2013-12-15. ↑ "FORD. STANDARDS_1/30/05" (PDF). Retrieved 2016-11-20. 1 2 "Carnegie Classifications | Institution Profile". Classifications.carnegiefoundation.org. Retrieved 2013-12-15. 1 2 "Fordham's Jesuit Tradition". Fordham.edu. 2013-07-18. Retrieved 2013-12-15. ↑ "Best Colleges: Fordham University". U.S. News & World Report. July 5, 2016. 1 2 3 4 5 6 7 8 9 10 11 12 13 14 15 16 "U.S. News Best Colleges Rankings – Fordham University". U.S. News & World Report. Retrieved 2016-09-13. ↑ Fordham. "Fordham Facts | Fordham". Fordham.edu. Retrieved 2016-11-20. 1 2 3 4 5 6 7 8 9 10 11 12 13 14 15 16 17 18 19 20 21 22 Schroth, SJ, Raymond. Fordham: A History and Memoir. Revised ed. New York: Fordham UP, 2008. Print. ↑ "Vincent Building, 302 Broadway (1943-1961) | Buildings | Fordham Law School". Ir.lawnet.fordham.edu. Retrieved 2016-11-20. 1 2 Shelley, Thomas (2016). Fordham: A history of the Jesuit university of New York: 1841-2003. New York: Fordham University Press. ISBN 9780823271511. ↑ "Fordham Preparatory School: Our History". Fordhamprep.org. Retrieved 2013-12-15. ↑ Post a Job Vitae is your link to top academic talent. (2008-02-17). "Fordham U. Sells Marymount College Campus for $27-Million – Graduate Students – The Chronicle of Higher Education". Chronicle.com. Retrieved 2013-12-15. ↑ "'Excelsior' Campaign Ends After Five Year Run, Raking in $540 Million – The Fordham Ram". The Fordham Ram. Retrieved 14 July 2015. ↑ "CATHOLIC ENCYCLOPEDIA: Ratio Studiorum". Newadvent.org. 1911-06-01. Retrieved 2013-12-15. ↑ "Core Curriculum, Fordham College at Rose Hill (FCRH) – Fordham University". Fordham.edu. 2013-07-18. Retrieved 2013-12-15. ↑ "Gabelli School of Business — Innovative Integrated Core Curriculum". Fordham.edu. 2003-10-28. Retrieved 2013-12-15. ↑ "Academics". Fordham.edu. 2013-07-18. Retrieved 2013-12-15. ↑ "Pre-Health/Pre-Medical Professions Advising, Fordham College at Rose Hill (FCRH)-Fordham University". Fordham.edu. 2013-07-18. Retrieved 2013-12-15. ↑ "Majors, Minors, and Certificate Programs; Fordham College at Rose Hill (FCRH) – Fordham University". Fordham.edu. 2013-07-18. Retrieved 2013-12-15. ↑ "Pre-Architecture". Fordham.edu. Retrieved 2013-12-15. ↑ "Undergraduate Degree". Fordham.edu. 2013-07-18. Retrieved 2013-12-15. ↑ "3–2 Cooperative Program in Engineering". Fordham.edu. 2013-07-18. Retrieved 2013-12-15. ↑ "Gabelli School of Business — Majors and Programs — Accounting". Fordham.edu. 2003-10-28. Retrieved 2013-12-15. ↑ "B.F.A. Program | The Ailey School". Theaileyschool.edu. 2013-11-01. Retrieved 2013-12-15. ↑ "Fordham College at Lincoln Center". Fordham.edu. Retrieved 2013-12-15. ↑ "Doctoral Consortium". Fordham.edu. 2013-07-18. Retrieved 2013-12-15. ↑ "Fordham And Yeshiva Boost Science/Medical Offerings Through Agreement | Albert Einstein College of Medicine". Einstein.yu.edu. 2008-10-29. Retrieved 2013-12-15. ↑ "Valhalla, NY – Student Group Fights Possible Touro Merger". VosIzNeias.com. Retrieved 2013-12-15. ↑ "Fordham College". Namss.org. Retrieved 2013-12-15. ↑ "Fordham School of Professional and Continuing Studies". Fordham.edu. Retrieved 2013-12-15. ↑ "About Fordham Libraries". Library.fordham.edu. 2003-10-28. Retrieved 2013-12-15. ↑ "Interlibrary Loan Services (ILL) – Fordham University Libraries". Library.fordham.edu. 2003-10-28. Retrieved 2013-12-15. ↑ Franek, Robert, and Princeton Review. The Best 351 Colleges. 2004 ed. Princeton Review, 2003. Print. ↑ "Center for Medieval Studies". Fordham.edu. 2012-09-17. Retrieved 2013-12-15. ↑ "Fordham University Rose Hill Campus". Fordham.edu. Retrieved 2013-12-15. ↑ Pogrebin, Robin. "Fordham Opens Its Gift: An Antiquities Museum." The New York Times 6 Dec. 2007. Print. ↑ "University's Art Collection Takes Form". Fordham.edu. Retrieved 2013-12-15. 1 2 "Fordham University Lincoln Center Campus." Public Hearing, New York City Council, Subcommittee on Zoning and Franchises. Print. ↑ "Archives and Special Collections". Library.fordham.edu. 2003-10-28. Retrieved 2013-12-15. 1 2 "The Louis Calder Center". Fordham.edu. 2013-07-18. Retrieved 2013-12-15. ↑ "History". Fordham.edu. 1964-12-17. Retrieved 2013-12-15. ↑ "Fordham Partners with Four Bronx Institutions". Fordham.edu. 2013-07-18. Retrieved 2013-12-15. ↑ "Professor Discovers New Form of Nuclear Matter". Fordham.edu. 2013-07-18. Retrieved 2013-12-15. ↑ "Press Strikes Distribution Deal with Oxford". Fordham.edu. 2003-10-28. Retrieved 2013-12-15. ↑ Fordham. 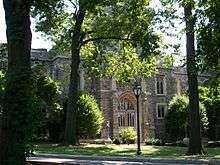 "Fordham College at Rose Hill". Retrieved 14 July 2015. ↑ McClain, Joseph (2012-07-05). "William & Mary – Media turn to W&M physicist for Higgs boson explanations". Wm.edu. Retrieved 2013-12-15. 1 2 3 4 5 6 Undergraduate Bulletin 2010–2012. Fordham University, 2009. Print. ↑ "Honors Program, Fordham College at Rose Hill (FCRH) – Fordham University". Fordham.edu. 2013-07-18. Retrieved 2013-12-15. ↑ "Top Producers of U.S. Fulbright Students by Type of Institution, 2011–12 – International – The Chronicle of Higher Education". Chronicle.com. 2011-10-23. Retrieved 2013-12-15. ↑ "Gabelli School of Business – Academics: Boyle Society". Fordham.edu. 2003-10-28. Retrieved 2013-12-15. ↑ "Fordham Graduate School of Business :: Fordham University". Bnet.fordham.edu. 2003-10-28. Retrieved 2013-12-15. ↑ The author of this section advises readers to use caution in interpreting this information. Rankings data can be misleading if superficially examined. See O'Shaughnessy, Lynn. "Rating the College Rankings." CBS MoneyWatch. CBS Broadcasting, Inc., 12 Sept. 2012. Fordham officially disputes U.S. News & World Report’s A+ Schools for B Students ranking as well as The Princeton Review’s Best 377 Colleges: Worst Food sub-ranking. See Kultys, Kelly. "Rochelle Group Releases Report of Sodexo Food Services, Facilities." The Fordham Ram [Bronx] n.d. 30 Jan. 2013. Web. 17 Feb. 2013. ↑ "Fordham University". Forbes.com. Retrieved 2016-06-07. ↑ "Kiplinger's Best College Values – Private Universities". Kiplinger.com. December 2014. Retrieved 2015-05-10. ↑ "Fordham University: Gabelli School of Business – Undergraduate Profile – Businessweek". Businessweek.com. Retrieved 14 July 2015. ↑ "College Rankings". Princetonreview.com. 2013-09-22. Retrieved 2013-12-15. ↑ "Newsweek Selects Fordham Among Hottest Schools in America". Fordham.edu. 2013-07-18. Retrieved 2013-12-15. ↑ spec init. "U-CAN:University and College Accountability Network". Ucan-network.org. Retrieved 2013-12-15. 1 2 "Top Business School Rankings: MBA, Undergrad, Executive & Online MBA". Businessweek. Retrieved 2013-12-15. ↑ "Business school rankings from the Financial Times – Executive MBA Ranking 2013". Rankings.ft.com. Retrieved 2013-12-15. ↑ "Highly-ranked French engineering school – MINES PARISTECH". Mines-paristech.eu. Retrieved 2013-12-15. ↑ "in New York City". Top Universities. Retrieved 2016-11-20. ↑ "Services". Fordham.edu. 2013-07-18. Retrieved 2013-12-15. ↑ "Arthur Avenue | The Real Little Italy of New York". Arthuravenuebronx.com. Retrieved 2013-12-15. ↑ "Pretty college campuses – Travel – Destination Travel | NBC News". MSNBC. 2008-09-15. Retrieved 2013-12-15. ↑ "National Register of Historic Places Official Website-Part of the National Park Service, U.S. Department of the Interior". Nps.gov. Retrieved 2013-12-15. 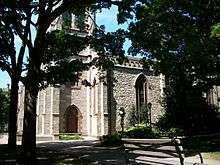 ↑ "Fordham University Church". Fordham.edu. Retrieved 2013-12-15. ↑ "Fordham University – The Office Of Residential Life at Rose Hill". Fordham.edu. Retrieved 2013-12-15. ↑ "The Fordham Jesuit Community". Fordham.edu. Retrieved 2013-12-15. ↑ Gannon, S.J., Robert I. (1967). Up to the Present. Garden City, NY: Doubleday & Company, Inc. p. 297. be interested in an alternative involving a new building in a part of the area to the north of Columbus Circle to be redeveloped under Title One of the Federal Housing Law... If this idea appeals to you I will ask Mr. Lebwohl to see you and explain it in greater detail. ↑ Schroth, Raymond (2008). Fordham: A History and Memoir. New York: Fordham University Press. pp. 240–241. ISBN 9780823229772. 1 2 "Fordham University Lincoln Center Master Plan Proposal Summary". Retrieved 2013-06-22. ↑ Mercuri, Joanna (2015-08-11). "Fordham Offices Move to New Location on Columbus Avenue". News.fordham.edu. Retrieved 2016-11-20. ↑ "Fordham Westchester". Fordham.edu. 2013-07-18. Retrieved 2013-12-15. ↑ "Beijing International MBA at Peking University". En.bimba.edu.cn. Retrieved 2013-12-15. ↑ "HEOP". Fordham.edu. 2013-07-18. Retrieved 2013-12-15. ↑ Rose Hill Society Ambassador Handbook. ↑ "Lincoln Center Expansion Lawsuit Dismissed". Fordhamobserver.com. Retrieved 2013-12-15. ↑ "Ailey Fordham". Atrium.lincolncenter.org. 2012-11-29. Retrieved 2013-12-15. ↑ "Student Leadership & Community Development". Fordham.edu. Retrieved 2013-12-15. 1 2 3 4 Fordham. "Global Outreach". Retrieved 14 July 2015. 1 2 Fordham. "Our Story". Retrieved 14 July 2015. ↑ "Patriot League Official Athletic Site". PatriotLeague.org. 2013-10-09. Retrieved 2013-12-15. ↑ "History". St. Louis Rams. Retrieved 2013-12-15. ↑ "Amazing 'Fordham Flip' has fans abuzz | MLB.com: News". Mlb.mlb.com. Retrieved 2013-12-15. ↑ Curry, Jack (5 April 2009). "For 150 Years, Fordham Baseball's Tradition of Winning". The New York Times. Retrieved 2014-06-25. ↑ Watts, Mike (March 10, 2014). "Fordham Wins Atlantic 10 Championship". WFUV. Retrieved 2014-06-25. ↑ "Fordham women set NCAA mark with 0–29 season". USA Today. 1 March 2008. Retrieved 2014-06-25. ↑ Gosier, Chris. "Fordham Observer: A Better Newspaper". Fordham Notes. ↑ The Ram. "The Ram Website". The Fordham Ram. ↑ the paper. "the paper website". the paper. ↑ "Abou". WFUV Radio. Retrieved 31 March 2013. ↑ Waits, Jennifer. "2012 Princeton Review's 20 "Most Popular" College Radio Stations". Princeton Review. Retrieved 31 March 2013. 1 2 Kelley, Tim. "The History of The Mimes and Mummers". The Mimes and Mummers. Retrieved June 19, 2016. ↑ "The Mimes and Mummers". The Mimes and Mummers. Retrieved June 19, 2016. ↑ MATT SEDENSKYPublished: May 05, 2002 (2002-05-05). "NEIGHBORHOOD REPORT: FORDHAM; Fordham Debate Team: From Patsy to Powerhouse – New York Times". Nytimes.com. Retrieved 2013-12-15. ↑ "Campus Ministry". Fordham.edu. Retrieved 2013-12-15. ↑ "Dorothy Day Center For Service & Justice". Fordham.edu. Retrieved 2013-12-15. ↑ "National University Rankings 2011". Washington Monthly. Retrieved 2013-12-15. ↑ "New York Province Society of Jesus – Province Health Care Center". Nysj.org. Retrieved 2013-12-15. ↑ A., Orsini Elizabeth. "Experience NYC: Urban Plunge". www.fordham.edu. Retrieved 2016-05-07. 1 2 3 4 "Army ROTC Ram Battalion". Fordham.edu. 2013-07-18. Retrieved 2013-12-15. ↑ "Nursing Scholarships". Fordham.edu. 2013-07-18. Retrieved 2013-12-15. ↑ "Fordham Veterans Initiative". Fordham.edu. 2013-07-18. Retrieved 2013-12-15. ↑ "President's Ball". Fordham.campusgroups.com. Retrieved 2013-12-15. ↑ "Traditions". Fordham.edu. 2013-07-18. Retrieved 2013-12-15. ↑ Arts and Culture Film Literature Museum Music Theater (2012-05-02). "Spring Weekend a Success Despite Low Expectations". Fordhamobserver.com. Retrieved 2013-12-15. ↑ "The Christmas Festival of Lessons and Carols". Fordham.edu. 2003-10-28. Retrieved 2013-12-15. ↑ "In Brief". Fordham.edu. Retrieved 2013-12-15. ↑ "Football Team Beats Columbia, Reclaims Liberty Cup". Fordham.edu. 2013-07-18. Retrieved 2013-12-15. ↑ "FCRH Accomplishments Honored at Encaenia Ceremony". Fordham.edu. 2013-07-18. Retrieved 2013-12-15. ↑ "And Now, Hail Rams of Fordham". Retrieved 14 July 2015. ↑ ""The Ram" Sheet Music". Fordham.edu. Retrieved 2013-12-15. ↑ Fordham. "Careers". Retrieved 14 July 2015. ↑ Stellabotte, Ryan (2015-10-16). "Metadiplomat: The Real-Life Story of Bridge of Spies Hero James B. Donovan". News.fordham.edu. Retrieved 2016-11-20. ↑ "Victor F. Hess – Biographical". Retrieved 14 July 2015. ↑ "OnlineDegrees.com – Online Education Resource". Retrieved 14 July 2015. ↑ Keith R. A. DeCandido (2009). Star Trek: The Next Generation: A Singular Destiny. Simon and Schuster. p. 50. ISBN 9781416598138. ↑ "Sustainability". Fordham.edu. 2013-07-18. Retrieved 2013-12-15. 1 2 "Accreditation". Fordham.edu. 2013-07-18. Retrieved 2013-12-15. ↑ "Current Members". AGB. Retrieved 14 July 2015. Wikimedia Commons has media related to Fordham University. "Fordham". The American Cyclopædia. 1879.